Wildwood makes it easy to accessorize with out convenient wood fired pizza oven. If you are just getting started with wood oven cooking, this a great kit for you! 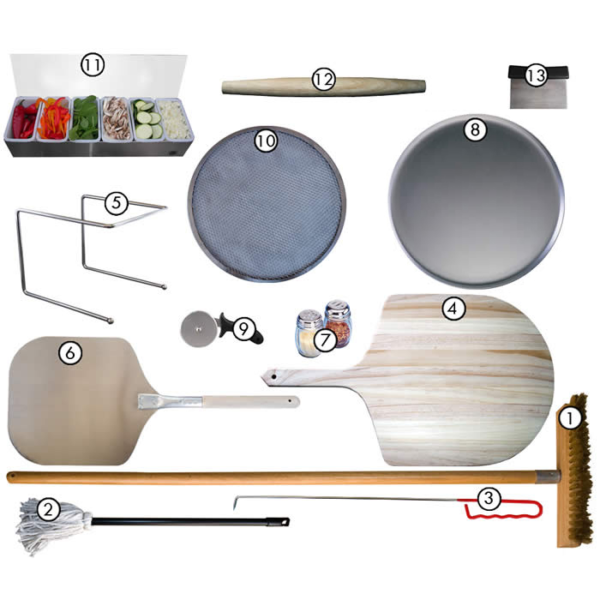 Every item in the kit has been selected by our culinary department as the “essential tools to have”. This 12 ” metal pizza peel is perfect for personal pizzas or oven baked sandwich. Also comes in handy if a pizza gets stuck to the hearth. Pizza making is easy as pie with this six compartment topping organizer. Fill with you favorite ingredients and top your pizza any way you like. Our all time favorite rolling pin. Simple, traditional design. Great maneuverability. An excellent tool for bread and pizza dough making. Doubles as both a cutter, and a scraper for cleaning off the cutting board. Great for transferring chopped food items.